Once upon a time, in a state far, far away (Texas), I started this quilt. 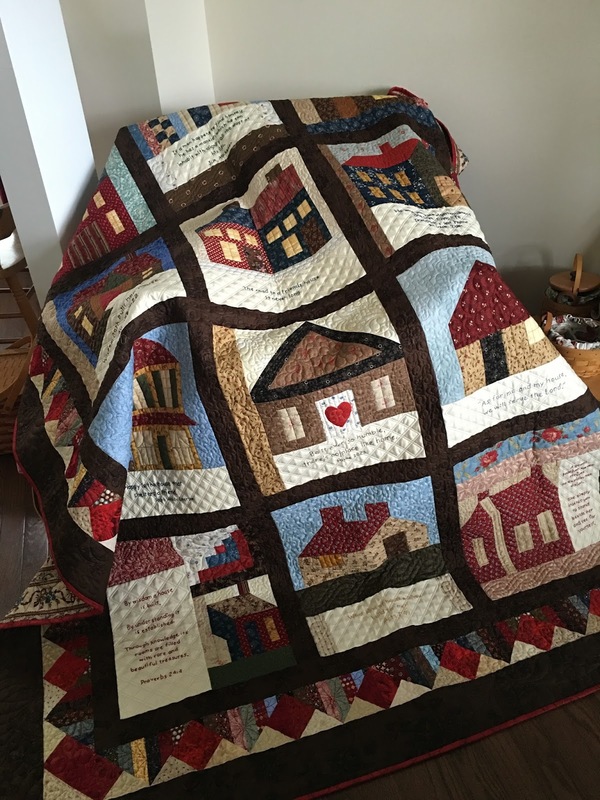 It was BOM (Block of the Month) from Quilts With A Heart. I loved the houses, but I really loved the verses that went with the houses. I loved how it was so scrappy as well. I did pretty good keeping up with the embroidery and the houses each month. It was hand embroidery and you know how much I love the four letter "H" word. You can read about my house BOM progress here, or here. But I got way laid when it came time to set it together. Nothing worked or looked right. And what about a border? 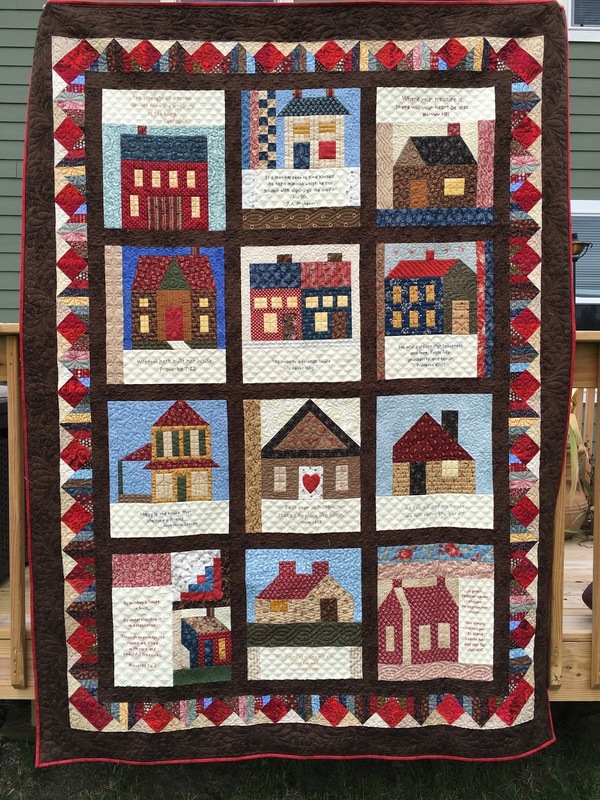 Angela at Quilts With A Heart was going to do small log cabin blocks around her houses. Now I LOVE log cabin blocks but I HATE making them. They are SEW boring! Nope, I was not making that many log cabin blocks. Then I was at a quilt shop and saw a border on a scrappy quilt and loved it. I ask about a pattern and the employee at the shop had no idea where the maker of the quilt got the border pattern. It certainly was not the border on the pattern that was attached to the quilt. So... I was on a mission. I designed my own border. But still now layout for the blocks. I tried red, black, navy blue, nothing was working for me. Black was the best but really it just wasn't working for me and at that time I would have had to go buy more. And then it happened quite by accident. 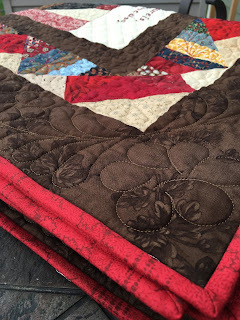 I had a piece of brown fabric laying on my cutting table and laid the quilt blocks on top of it to set aside for some auditioning later and BINGO, that was the color I needed. Here are close ups of each of the twelve blocks. One of the bible verses has the wrong credit. Can you find which one it is? I obviously don't know my bible well and/or was lazy and didn't go look them up but someone in the group did. A correction was sent but I had already embroidered my block and was not going to fix it now. Here is a close up of the border. It was really pretty easy. It's essentially a flying geese block that the "geese" have been stripped pieced and then some half square triangles make up the "sky"
That's another FLIMSY quilted and bound! Whoo Hoo!!! 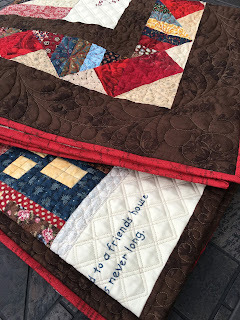 I linking up with Crazy Mom Quilts on her Finish It Up Friday linky party and Quilt Shop Gal on her Creative Goodness linky party. Go be inspired by all the creative goodness floating around on these sites. And HAVE A GREAT WEEKEND!!! The quilting is incredible and that brown fabric is so rich it suits this quilt to a tee. And each block is very sweet, Doris. I couldn't choose a favourite! Love the brown fabric for the borders! Glad you found it as the house blocks are so cute! 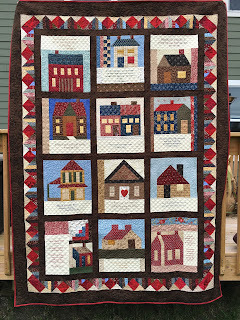 Popping in from Crazy Mom Quilts as part of my blog comment challenge - 300 comments in 30 days! A real estate is a property, consisting of a house and land being bought and sold. Virtual Usrelocationtips is different. It's not about a property being sold online or a virtual home.